Testing an application before entrusting your business to it is essential, and having an efficient, accurate, and appropriate environment in which to test is an important element of the process. Implementing a private test cloud can be the ideal way to establish this environment. A cloud model enables your users to access consumer IT resources in a test center in ways not previously available. Unlike traditional testing methods, this model dramatically decreases the many manual steps and traditional processes of setting up a test environment, allowing for a quick turnaround of resource requests. On demand provisioning and configuration of virtualized resources, can help you reduce capital investments, test cycle times, and IT labor costs. Cloud computing also offers scalability to handle fluctuating business needs, minimizes configuration errors, streamlines the environment and improves solution quality. 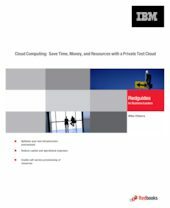 This IBM® Redguide describes the benefits of a private test cloud and discusses how to take advantage of IBM services offerings to help you get started.